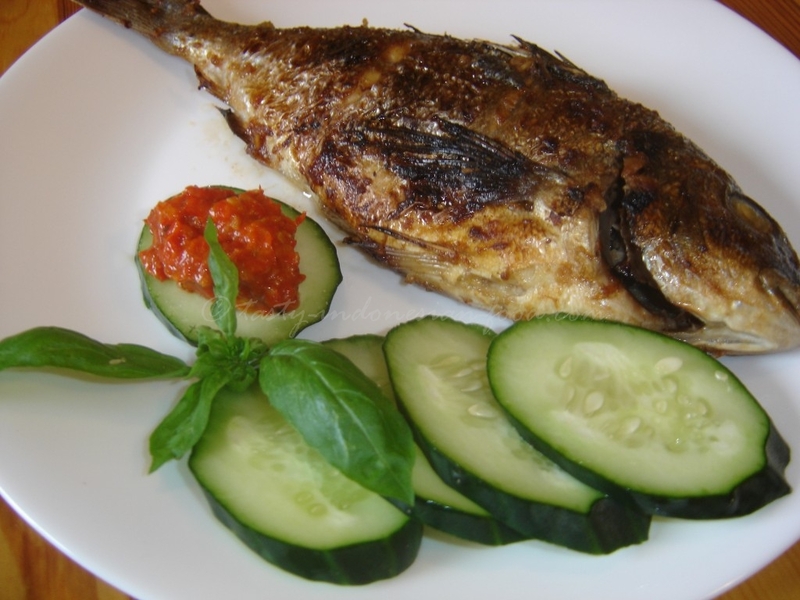 Grilled Fish or Ikan Bakar is very popular in Indonesia, especially in Sulawesi and Maluku where most of the people work as the seaman/fisherman. Both areas have a very huge sea which brings them different kind of seafood. Here’s a simple recipe how to make a delicious grilled fish. 1. Clean the fish and make cutlets around it. Pour the lime juice over it to reduce the fishy smell. 2. Blend or grind all marinate ingredients. Then use it to marinate the fish. Set aside for at least 1 hour. 3. When the marinate is absorb enough, using charcoal grill, grill the fish and brush it with marinate leftover. 4. When the fish is about to be ready, brush with sweet soy sauce (kecap manis) and margarine. Continue grilling until it’s cooked. 5. If you are using electric oven : Set it to 180 C for roasting. Each side roast for 5 minutes. Be careful not to burn the fish, when it’s about 3 minutes, check the situation. Then continue grilling with normal setting for 20-25 minutes. Tips: you can grill the fish by wrapping it with Banana leaf (daun Pisang) so that the skin won’t be stick into the grill appliances.